Butterscotch Blonde ash Nitro finished, tinted 9.5" birds eye maple neck, Bill Lawrence Keystone pickups, 4-way switch, Wilkinson vintage bridge with brass compensated saddles. UPDATE: Due to owing taxes instead of getting a refund this year, the Tele purchase has been postponed indefinitely! Thank you all for your input. I might be able to pull off a Squier Tele, which sure isn't a bad choice these days. I'd narrow it down to the first two... The MIM is still an MIM, and you'd never get anywhere near out what you paid for it if you didn't like it and decided to sell / trade it. The koa tele, while cool, is a little high on the price, IMO... I think, if memory serves, they were $699 new. So, I'd try out the Baja and American Special and see which neck you like best. Don't forget the Highway 1 model, if you can find it. I love the necks on those, both Tele and Strat. I like the quality of the first two as well. I have played the American Special and was really impressed with the pickup's tone and overall quality. I'll demo a Baja soon. Also, the top two can be bought from local independent shops, which is important to me. Edit: The Koa Tele sold for $500 +shipping on ebay. I watched to see the price, but decided against buying it. I don't want to think of resale values etc. I just get guitars for using them and preferably cheap...so for me that MIM job sounds like a really sweet axe. Hardly a classic tele in any way sight or sound though. That said, I do now and then eyeball a nice gibson used...there was one pretty sweet SG standard for 800 on sale here, and if I won in a lottery or something, I'd get one. I'm with Dee on this one. The third one you listed (blue, MIM?) with the mods is the one I'd gravitate toward first. Resale value is something worth considering, but ultimately it's probably not what would drive my decision. Yes Dee and Eric, resale value is pretty low on my guitar buying decisions. Sound and feel are at the top. I'll likely mod any single coil neck with a Seymour Duncan mini humbucker. 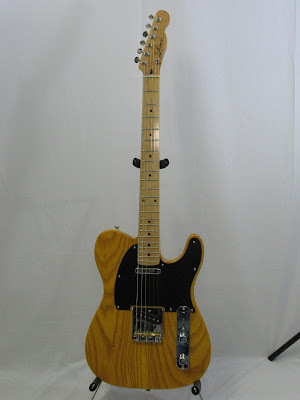 What's so cool about the modded MiM blue Tele is it already has almost every upgrade I would do to the other Tele's. They also perform a pro setup, so the sucker should be ready to rock on arrival. I'll still demo the American Special and Baja before making my big choice. The Special sounds really sweet, so the bar is set high.